As you guys may recall, I am a lady that loves me some crystals, gemstones, and minerals. I was excited by the historical insights offered by “A Lapidary of Sacred Stones” by Claude Lecouteux and Isidore Kozminsky’s “Crystals, Jewels, Stones: Magic & Science” but I was downright thrilled to be given access to the practical, revised and expanded edition of, “The Encyclopedia of Crystals” by Judy Hall. You may recognize Hall’s name as the author of “Crystals and Sacred Sites: Use Crystals to Access the Power of Sacred Landscapes for Personal and Planetary Transformation” that I reviewed here on The Buffet. Well, when Hall isn’t busy proposing new theories on how to use crystals she’s authoring some of the most definitive guides to minerals and gemstones. So why are her books some of the best out there? Glad you asked. My favorite feature, and the most obvious, is that the crystals are laid out (or listed if you prefer) in the book by color. How great is that? Hey, I have this purple stone and I can’t remember what it is. No problem, I’ll pull out the “Encyclopedia” and flip to the purple section and see what it matches up with. How awesome is that? But I know what stone I want to read about! Again, not a problem. There is an alphabetical crystal index at the front of the book and there is a thorough index in the back of the book as well. There is also a short but very informative introduction that covers everything from basic geology to the chakras. Each stone is given a fantastic image or two to help with identification. Then they list: crystal system, chemistry, hardness, source, chakra, number, zodiac sign, planet, and what it’s beneficial for. After that there is a paragraph with historical and folkloric detail. 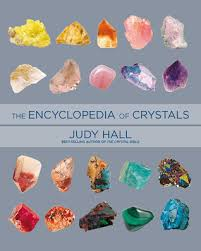 Judy Hall’s “Encyclopedia of Crystals” is an absolute must own for anyone interested in minerals and gemstones. If you’re going to own just one book as a resource on crystals, this is the one. Next postDoes Religion Play a Positive Role?